Welcome to the most exciting Tourist attractions and Travel Destinations in Canada. Each Province/Region of Canada offers different places of interest and types of Attractions. Canada is one of the world's highly developed countries with a diversified economy that is reliant upon its abundant natural resources. Canada has a large domestic and foreign tourism industry. The second largest country in the world, Canada's incredible geographical variety is a significant tourist attracton. Much of the country's tourism is centered around Canada's four largest cities, Toronto, Montreal, Vancouver, and Ottawa, well known for their culture, diversity, as well as the many national parks and historic sites. Canada's borders extend from the Atlantic Ocean in the east to the Pacific Ocean in the west and northward into the Arctic Ocean and borders the entire length of the northern United States. Canada's vastness stretches over six time zones. Capital is Ottawa. 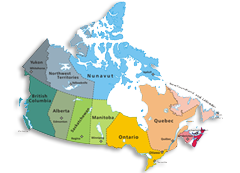 Canada has ten provinces and three territories and is governed by a parliamentary democracy and a constitutional monarchy, with Queen Elizabeth II as its head of state. Visitors to Canada including US citizens must carry a valid passport. Citizens from the Countries other than the US, Kingdom, France, Germany, Mexico, Japan, the Republic of Korea, Australia may also require a visa to enter Canada. If you are traveling with children, you must carry identification, such as a birth certificate, proof of citizenship or student visa for each child under 18 years old. The Canadian dollar (CAD) is the currency of Canada. It is abbreviated with the dollar sign $, or C$ to distinguish it from other dollar-denominated currencies. It is divided into 100 cents. Handguns and weapons, such as mace and pepper spray, are prohibited from entering Canada. Non-Canadian citizens may bring a non-restricted firearm such as a hunting rifle or shotgun if it is being used for in-season hunting, competition purposes, in-transit movement or as protection against wildlife in remote areas of Canada. In addition, many agricultural items are restricted or prohibited entry to Canada. Many fruits, vegetables, honey, eggs, meats, dairy products and plants from other countries cannot be brought into Canada. Canadian law requires that you declare all agricultural products you bring into Canada to customs officers when you arrive, whether it is by land, water or air. Permission is required to import plants to Canada, with the exception of houseplants from the United States. Canada offers a broad range of cultural and geographical features. The mighty Rocky Mountains and powerful pacific tides meet with vibrant communities in British Columbia, while urban flair mixes with cowboy culture in Alberta. Rural living comes alive under endless skies in Saskatchewan and Manitoba, while Ontario offers a diverse mix of big-city sophistication and relaxed country living. The sights and sounds of historic Quebec are not to be missed and the friendly fishing villages of Atlantic Canada are well worth the visit. Northern Canada offers visitors a chance to take in some of the only truly untamed landscapes in the world. Attractionscanada.com features information about the Top Canadian Attractions, Top Tourist Destinations, Events & Festivals, Things to Do, Getaways and Popular Sightseeing Tour packages.